The library is hosting two exhibits celebrating identity. # I am Cal Poly is a MultiCultural Center campaign and Kennedy Library exhibit in partnership with Dr. Jennifer Teramoto Pedrotti. 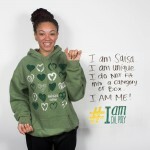 # I am Cal Poly is designed to engage the campus in conversation about the meaning of intersecting identities. 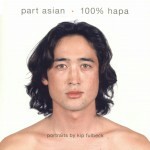 The exhibit is accompanied by the traveling exhibit kip fulbeck: part asian, 100% hapa. The opening reception will feature a talk by Kip Fulbeck, photographer, spoken word performer, and filmmaker. Fulbeck is the author of several books including Mixed: Portraits of Multiracial Kids; Part Asian, 100% Hapa; and Permanence: Tattoo Portraits, as well as the director of a dozen short films including Banana Split and Lilo & Me. Fulbeck teaches as a Professor of Art at the University of California, Santa Barbara, where he received the university’s distinguished teaching award and has been named an outstanding faculty member five times in recognition for his work promoting multiracial awareness. The reception is co-sponsored by Kennedy Library and the MultiCultural Center. Sunny Friday! It's 3:12pm right now.